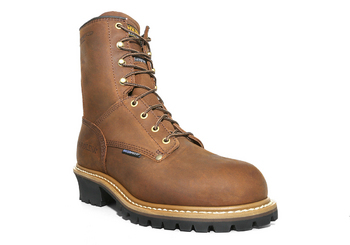 Carolina CA5821 8" Waterproof Insulated Safety Toe Logger. They’re waterproof and moderately insulated with 600 Grams of Thinsulate insulation to keep out the weather. They have tough steel shanks for extra stability. Their sure-grip rubber soles keep your feet planted where you put them. And they have steel toes. Serious work boots.